The God of the universe is CRAZY about you! His LOVE is the most POWERful thing in the world and He wants to give it to you, so you can LIVE for Him. 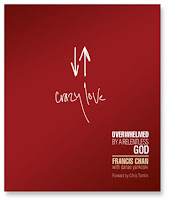 Author Francis Chan shares from his own life struggles and sacrifices ~ issuing a call for selfless Christ-like living. Let the LOVE you have received from God impact your life like never before. Making a commitment to follow Christ is the most incredible decision that you will make in your lifetime; but choosing to die to self and allowing the Holy Spirit to change you from the inside out is when real EMPOWERMENT comes into your life. I encourage you to download this FREE copy of CRAZY LOVE A.S.A.P., as there are ONLY a few days left to receive this amazing free audio offer from Christian Audio. Add the download format of Crazy Love to your cart and enter the coupon code JUL2009 when prompted during checkout. Do it now; and listen later. This is one resource that you will want to have in your library! Please pass this incredible LIFE-CHANGING resource on to all your friends! "More of Him; less of me...that is how it is supposed to be!"